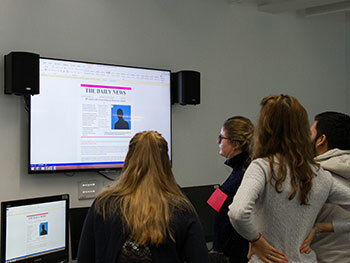 BA (Hons) Journalism students from the Arts Design and Media Faculty battled BA (Hons) Marketing PR students from the Business, Law and Social Science Faculty earlier this month in their first ever cross-Faculty WarGames. Based on a famous oil rig spill, the purpose of the games was to put students’ skills to the test by giving them a real-life scenario and pitting them against the type of people they would be reacting to in industry. BA (Hons) Marketing students acted as PR planners and represented an oil company bidding to protect its reputation after the disaster killed several workers, whilst BA (Hons) Journalism students interviewed them and communicated the story as it unfolded. It has been great fun, a brilliant learning experience for the students. University is the place for them to make mistakes, learn from those experience and equip themselves with the skills for real life scenarios. I certainly feel a lot more comfortable in that environment having gained some form of experience in it now, so I feel I could certainly hold my own and give a good account of myself in a press conference. I can't give enough credit to Ross for co-organising it, and I know his third year class wholeheartedly agree that it was fantastic.